I woke up earlier this morning. It was milder in the morning. I would be able to ride out tomorrow in the morning. Sachiko was about to go to CIudad del Este to get her "exit stamp" of Brazil, then she was planing to catch a 12 noon bus to Santa Cruz, Bolivia. But she realised she would not have enough time to ctach the bus, so she decided to stay 1 more day. 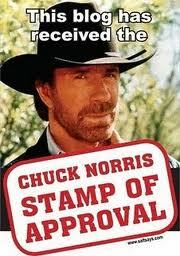 She went to Este toget the stamp and buy the ticket abyway. Today, 2 more friends left here - Atsushi and Taro. It is about time for me to restart my trip as well. With Tatsu and Kotaro, I went to Co-op supermarket. We made Cold Chinese Noodle again for lunch. It got really hot again around the lunch time. After lunch, I had a nap. When I got up, Kazuko the bread maker was here. I bought a cream bun and cookies from her as it would be the last chance. Shin was cutting Mr. Sonoda's hair. He is the professional hair dresser. 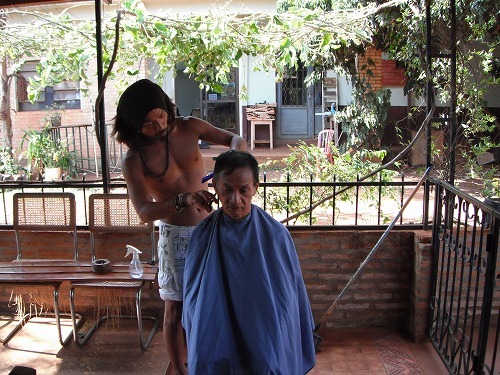 It's cool to see him working as the hair dresser. He also cut the hair of Kazuya - a staff member of the hostel later. For dinner, we cooked stir-fried noodle. Here at Pension Sonoda, I re-recognised how fun cooking is. Also I could make my blog better. And the most of all, I met so many nice people here. I thank you all! I will continue my trip and have fun. I will be back here one day. I will go to Brazil tomorrow, heading to Bonito (will take 2 days to get there). I will re-united with Shin and Tatsu there. ******************************************************************************************************************************************************* I joined the "World trip blog ranking" Please click the button! I have a good news today. My blog is getting more popular and now it is ranked 48th among 1398 blogs (it was 74th yesterday). 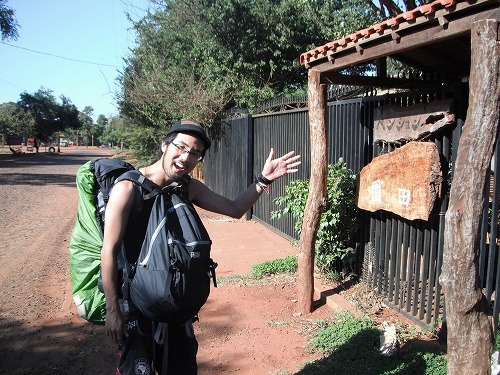 Thank you all for supporting my trip and blog! I added a few menu - "PROFILE" and "Why RWT?". Please have a look if you are interested. I tried to fix it for a while, but I could not do it... Please someone help me! 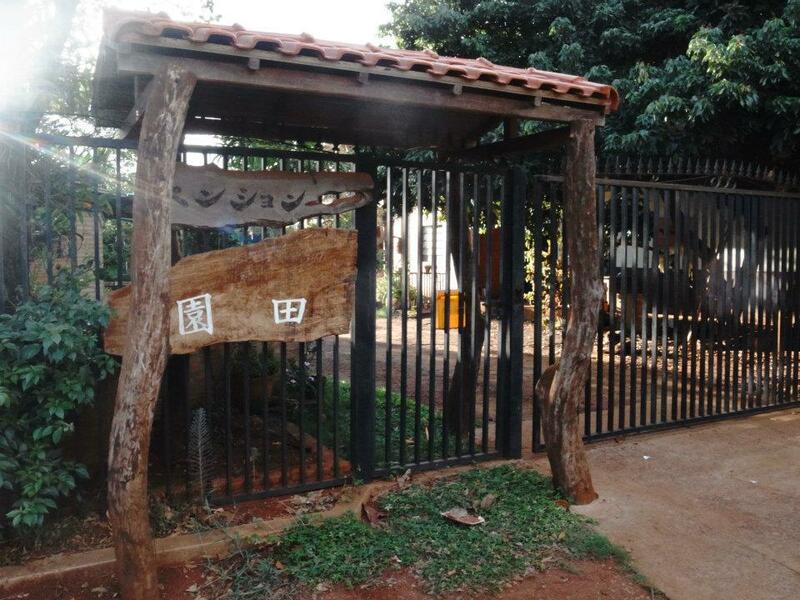 We planned to go to Bonito, Brazil together, but the access to Bonito from here isn't reallu good and some of the member do not have Brazil visa, we had to abandon the plan. So now my plan from here is leaving here on Thursday to Sao Paulo, Brazil, then catch up with Shin and Tatsu there. Then we catch a bus to Bonito together. We will go separate ways from there. I did not have any appetite as it was too hot. So I had only some fruits and the left over potato salad from yesterday for lunch. Then I went to my room and had a nap. In the evening, I got better. Tatsu the kick boxer went for a shopping, so we could make "Cold Chinese Noodle" for dinner. I could make the sauce pretty well! So even though we used pasta instead of a proper Chinese noodle, it was good! So tomorrow will be my last day here in Pension Sonoda. What will I do? I joined the "World trip blog ranking" Please click the button! It was a hot day again. To survive through this heat, tranquility is the key. So I tried not to do much today. 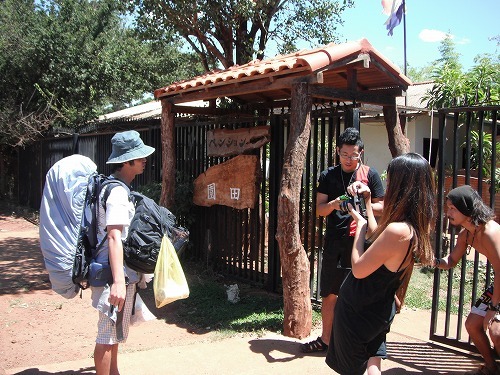 In the morning, Genji and Suzu left to Iguazu Falls. They stayed here just for 2 days only but it was fun to be with them. Have a nice day! Then, my dear friend Ike left to Buenos Aires. He was the mood maker of the hostel for more than a week. I will miss you Ike. Have a good trip!! We made potato salad, stir fried vegies and rice for lunch. As it was too hot and we did not have much appetite, we added some vineger into the stir fried sauce. If I ride the motorcycle in this heat, I would pass out! I had a nap in the afternoon. When I came out from my room, there were many new guests. 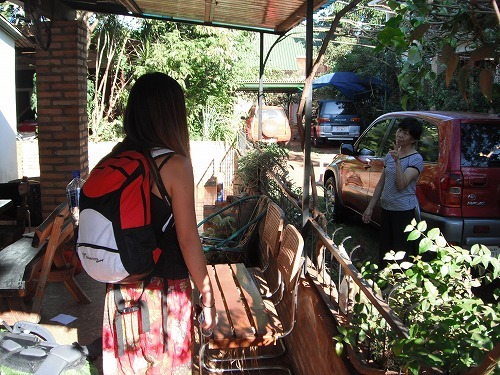 We picked some persimmons and star fruits from the backyard of the hostel. Well, I didn't do much again today. I need to move on to Brazil soon; otherwise, I will have shorter time in Europe. But it's tooooo hot to ride.... ******************************************************************************************************************************************************* I joined the "World trip blog ranking" Please click the button! It was a hot day. As I was exposed to the sun too long yesterday, I was stil tired when I got up. I need to take more vitamins to recover. I could not do much work this morning. 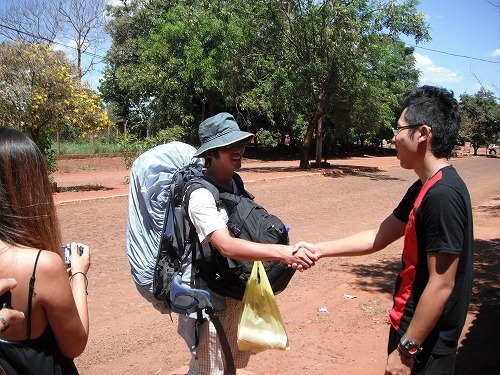 Saddly Ken&Yumi couple and Taku left to Asuncion. It's dad to see them off, but mis amigos buen viaje!! 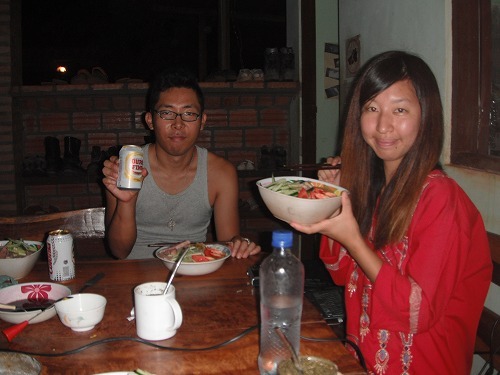 The most of the guests at the hostel went to the ramen shop, but Shin, Sachi and I remained here. We planned to cook something for lunch but the supermarket was closed by lunch time... So we cooked rice and instant noodles for lunch. Sachi offered us "Furikake" seasonings. After lunch, as it was a really really hot day, we spent whole afternoon at the terace without going out. I went for a nap in the late afternoon. As we could not buy any ingredient for dinner, we ate out at "Yguazu Grill". Mr. Sonoda gave us fresh soy beans, so we boiled them and had them as a snack. Boiled fresh soy beans is a very common snack in Japan while having beer. It was a special treat for us. As I had a nap in the afternoon, I got much better in the evening. But I decided not to leave tomorrow. I could not complete much of works today, so I will do them tomorrow.